On Friday 17 December, the security forces violently attacked oil workers demanding better living standards in Zhanaozen, Kazakhstan. Ten people were shot dead, more than 70 wounded, and 70 arrested, according to the government. 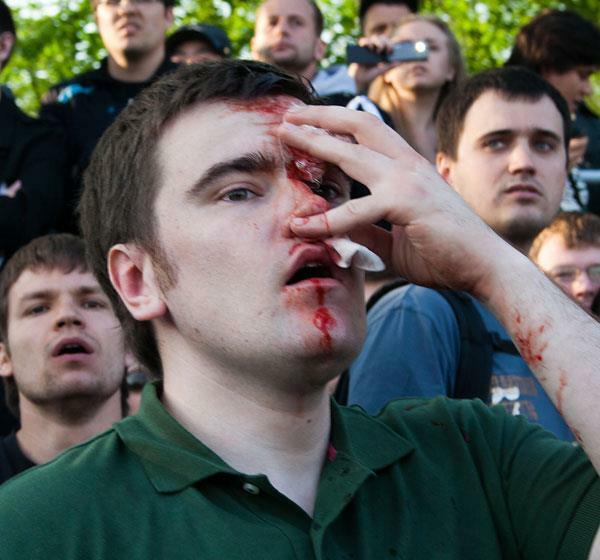 Opposition activists and Russian media say that the number of victims could be much higher. In spite of the massacre, the protests continued on 18 November. There were further clashes in nearby Aktau and Shetpe, and a 20-day state of emergency has been declared. Just like anti-capitalist protesters in Wall Street, the City of London and elsewhere, the Kazakh oil field workers established a “tent city”, in Zhanaozen’s main square, in June. When police tried to break it up in July, 60 of them covered themselves with petrol and threatened to set themselves on fire. Friday’s massacre took place in the same square. Kazakh oil workers’ communities – we are with you! The companies where most of the protesting oil workers work are partly owned by Kazmunaigaz Exploration and Production, which is listed on the London stock exchange and has often raised loans from London-based institutions. The UK is the third largest direct investor in Kazakhstan (after the USA and China). Tony Blair, the former prime minister, is being paid millions of pounds to lobby in the Kazakh government’s interests. Many other British businessmen and politicians help, too. Richard Evans, the former chairman of British Aerospace, is chairman of Samruk-Kazyna, a state-owned holding company that controls a big chunk of the Kazakh economy. The oil produced in Kazakhstan is traded in the offices of big oil trading companies and international oil companies in their London offices. On Friday December 16th a celebration of Independence Day in the Western Kazakhstan city of Zhanaozen ended up with violent clashes between police and protesting oil workers who have been striking since May, demanding wage increases. It has been reported that oil workers planned to have a peaceful rally on Zhanaozen’s main square but were attacked. According to report we have received, armed police were sent against the demonstrators. Some reports say the police used their weapons and some protestors were killed or injured. Please send a message to the Kazakhstan authorities calling on them to cease violence against their own people. I call upon the government of Kazakhstan to immediately cease violence against peacefully protesting oil workers and their families in the city of Zhanaozen. I believe that no government should ever use weapons against its own people. Violence against workers exercising their fundamental right to strike is absolutely unacceptable. This situation might have grave social and humanitarian consequences. Therefore I urge you to use all your power to to resolve this situation it in a peaceful and just manner. Please go here to send this message or your own message to Kazakh authorities. An independent source in Astana put the death count as high as 70, with more than 500 wounded, when police fired on protesters. In this guest blog, journalist Peter Salmon explores the background and root causes of the strikes and the repression that has rocked the Kazakhstan throughout 2011. The Kazakh authorities have responded to the oil workers’ revolt with arrests, jailings and police attacks on demonstrations, while company managements have sacked hundreds for striking. Despite the repression, the unprecedented wave of protests, which erupted in the oil-producing province of Mangistau in mid-May, was continuing at the time of writing in late August. At the movement’s height in early June, labour movement sources reported that 12-18,000 workers were on strike, demanding pay rises and recognition of independent trade unions. In late May the action spread to the larger workforce at OzenMunaiGaz, where workers – including transport drivers and those conducting well servicing and well workover operations – demanded pay rises to make up for rapid inflation since their increase last year and the slashing of bonus payments. On 24 May a local court declared strike action at the company illegal, but on 26 May there was a mass walkout nonetheless. The Kazakh oil workers’ struggle bears out the proposition of the labour historian Beverly Silver that “where capital goes, conflict goes”. [x] Since the break-up of the Soviet Union, western capital has made greater inroads into the oil sector in Kazakhstan than in Russia, where it has been somewhat constrained by statist and nationalist policies. In the last decade it has been joined by a gigantic inflow of Chinese capital. The Kazakh elite, who have been immensely enriched by the oil boom of the last decade, is the third part of the unholy trinity that workers face. In Mangistau region, oil production has expanded at a healthy pace. But the riches have been divided unequally: while billionaires flourish, and living standards have risen in the new and old capitals, Astana and Almaty, Mangistau has in terms of the UN’s development indicators only been lifted to the national average, from below it. And, staggeringly, although Mangistau produces more oil than any other Kazakh region, in 2008 it had the highest proportion of people living below the poverty line (32.4%) and the worst poverty by the UN’s measures. [xi] The immediacy of this injustice, the stark chasm between rich and poor, and a tradition of worker activism that has resurged in recent years, is a potent mixture that has now exploded. [i] “V Zhanaozene zakonchilas’ zabastovka neftianikov”, Ak Zhaiyk (Atyrau), 19 March 2010; “V Kazakhstane zavershilas’ dvukhnedel’naia zabastovka neftianikov”, Deutsche Welle web site, 21 March 2010, http://www.dw-world.de/dw/article/0,,5376521,00.html; Linksunten, “Kazakhstan: Mass strikes and protest action”, http://linksunten.indymedia.org/de/node/41875. [ii] Almaz Rysaliev, “Kazakstan’s Unhappy Oil Workers”, Institute for War & Peace Reporting web site, 24 June 2011, http://www.unhcr.org/refworld/docid/4e0b2a552.html; Central Asia Newswire, “Kazakh oil workers begin hunger strike”, 24 May 2011. [iii] “Bastuiushchie udarili po RD KMG”, Kursiv, 30 June 2011; Nadejda Atayeva, “Kazakhstan: vlast’ massovo raspravliaetsia s bastuiushchimi neftianikami”, http://nadejda-atayeva.blogspot.com/2011/07/blog-post_12.html. [iv] KMG EP press release, 28 June 2011; KMG EP annual report 2010, p. 26. The 2% fall was in comparison to 2009 output. [v] “Krovavyi razgon demonstratsii rabochikh v Aktau”, IKD, 5 June 2011, http://www.ikd.ru/node/17048; “V Moskve proidet aktsiia solidarnosti”, IKD, 6 June 2011, http://www.ikd.ru/node/17053; Nadejda Atayeva, “Kazakhstan: bezdeistvie vlastei”, http://nadejda-atayeva.blogspot.com/2011/06/blog-post_5744.html. [vi] Nadejda Atayeva, “Kazakhstan: vlast’ massovo raspravliaetsia”, op. cit. [vii] “Striking Kazakh Oil Workers Quit Ruling Party”, 11 August 2011, Radio Free Europe, http://www.rferl.org/content/striking_kazakh_oil_workers_quit_ruling_party/24294248.html. [viii] Nadejda Atayeva, “Kazakhstan: bespretsedentnoe davlenie na uchastnikov zabastovki”, http://nadejda-atayeva.blogspot.com/2011/08/blog-post_18.html; “Lider zabastovki neftianikov osuzhden”, Kursiv, 18 August 2011; KMG EP press release, 27 July 2011; “Bolee 400 bastovavshikh uvoleny”, Kursiv, 7 July 2011. [ix] “Sting nakazal Kazakhstan”, Kommersant, 4 July 2011; the web sites of Sting Symphonicity and Paul Murphy MEP. Sting, who was touring the whole former Soviet Union and did not cancel dates in e.g. Belarus or Uzbekistan, was criticised for being selective in his protest. [x] Beverley Silver, Forces of Labor: workers’ movements and globalization since 1870 (Cambridge, Cambridge University Press, 2003, p. 41). [xi] UNDP Kazakhstan, National Human Development Report 2009, pp. 103-109. David Cameron today demanded that tuition fee thugs face the “full force of the law” amid calls for an independent inquiry into the mob attack on the Prince of Wales and the Duchess of Cornwall. But the Prime Minister defended Scotland Yard’s handling of the situation, insisting there was no excuse for the “appalling” violence and vandalism. 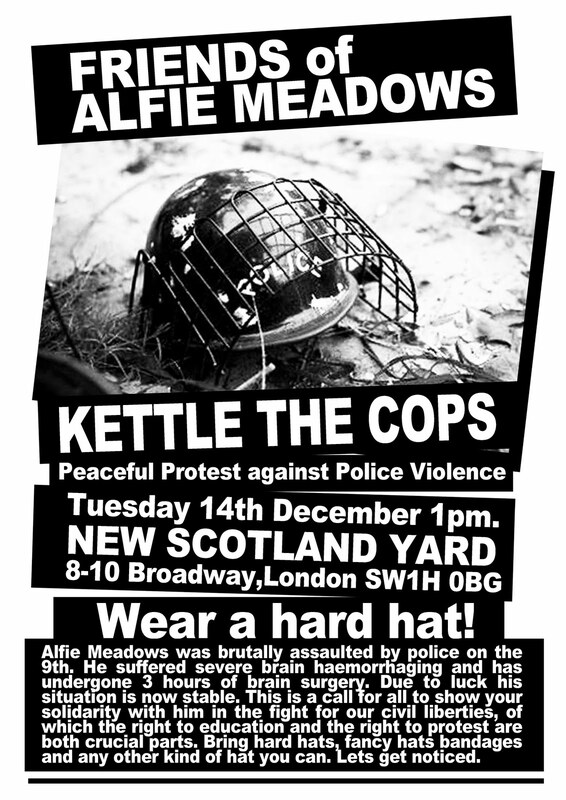 Shortly after Thursday’s vote, a policeman hit one of my current MA students on the head with his truncheon. He said it felt like he was struck by a solid metal bar. After being bandaged by other students and released from the kettle on account of his obvious injuries, police medics took a quick look at him, and checked that his eyes were still responding to light. According to my student, they recommended that he make his own way to his local hospital in North London, where he received stitches. At least a dozen of the students I work with didn’t escape the kettle so quickly, and were among the thousand or so people who were eventually forced back on to Westminster Bridge shortly after 9pm, without water or toilets, without information or explanation, in the freezing cold and wind, long after the media had gone home. They were then crowded together for a couple of hours between solid lines of baton-wielding riot police. Many students say they were beaten with truncheons as they held their open hands high in the air, in the hope of calming their attackers. My Kingston students say they saw people having panic attacks, people seized up with asthma, people who fell under the feet of the crowd. Some students claim that they were then kicked by police as they were slowly released, single file, through a narrow police corridor. Everyone was forcibly photographed, and many of the people detained on the bridge were then taken away for questioning. The story of one Middlesex undergraduate who used to sit in on my MA classes, Alfie Meadows, is already notorious. He received a full-on blow to the side of his skull. My partner and I found him wandering in Parliament Square a little after 6pm, pale and distraught, looking for a way to go home. He had a large lump on the right side of his head. He said he’d been hit by the police and didn’t feel well. We took one look at him and walked him towards the nearest barricaded exit as quickly as possible. It took a few minutes to reach and then convince the taciturn wall of police blocking Great George Street to let him through their shields, but they refused to let me, my partner or anyone else accompany him in search of medical help. We assumed that he would receive immediate and appropriate treatment on the other side of the police wall as a matter of course, but in fact he was left to wander off on his own, towards Victoria. As it turns out, Alfie’s subsequent survival depended on three chance events. If his mother (a lecturer at Roehampton, who was also “contained” in Parliament Square) hadn’t received his phone call and caught up with him shortly afterwards, the odds are that he’d have passed out on the street. If they hadn’t then stumbled upon an ambulance waiting nearby, his diagnosis could have been fatally delayed. And if the driver of this ambulance hadn’t overruled an initial refusal of the A&E department of the Chelsea and Westminster hospital to look at Alfie, his transfer to the Charing Cross neurological unit for emergency brain surgery might well have come too late. Gainesville, FL – Over 400 angry protesters – a coalition of students, local residents and university professors – rallied and marched to protest the racist police shooting of Kofi Adu-Brempong. We gratefully acknowledge receipt of this news from our comrades at Edu-Factory Collective and Occupy California. Almost 25 years after the end of the military dictatorship (1964 – 1985), Brazil still faces the ghosts of authoritarianism. Surprisingly, these spirits came back in the context of an institution which played a remarkable role in the resistance to the military regime. In the past few days, professors, students and workers of the University of Sao Paulo witnessed a police action which made the community aware of the lack of democracy in its own academic environment. On May 27th, workers blocked the entrance of four buildings in the State Capital campus. They asked for better wages and other labor demands. According to the rector, they were posting pickets during the strike to discourage other employees to work, an illegal act as stated by Brazilian laws. On June 1st, the administration called the police to intervene and stop the pickets. The police remained on campus and on June 9th, they attacked a group of students, professors and workers who were demonstrating against them. The police used tear gas, pepper spray and rubber bullets to disperse the protesters. This action generated lots of reactions. Several newspapers articles were published by those concerned, including faculty members, students and union members, showing anything but an opinion agreement on the police action. Part of the faculty supports the rector’s initiative to call the police and considered the intervention legitimate. On June 18th, more than 1,500 people demonstrated on the streets against the police reaction and its disproportion. In 2007, students occupied the building where the rector’s office is located. They were against some decrees passed by Governor Jose Serra with the support of the rector Suely Vilela. The decrees considerably reduced the autonomy of the university in favor of the State Secretary of Education, concentrating more power in the hands of the Governor. After the occupation, Jose Serra stepped back and voided the decrees. The University of Sao Paulo is responsible for 23% of all scientific production in Brazil. It has more than 86,000 students, 5,400 professors and 15,200 employees. The 2009 budget is about US$ 1.4 billion due to a disposition of the Sao Paulo State Constitution, which allocates 5% of all value added tax revenue of the State, which is the richest State in Brazil, to the university. It is clear that a major crisis in a university with these proportions reflects on local and national politics. 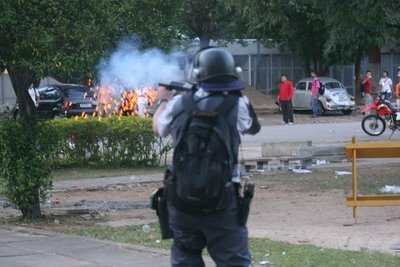 As the Philosophy professor of University of Campinas Marcos Nobre pointed out in a newspaper article, the police action is “the symptom, not the cause.” For him, this shows that despite having democratic institutions, “Brazilian society still has a low level of democratization.” The process to choose the university’s rector gives a good example of the way different groups are represented within the institution. Approximately 300 people vote to appoint 3 names to the State Governor, who is supposed to pick one. In this election, the group of “titular professors” (named chair professors) is majoritarian, and one must be a titular professor to become rector. Students and workers are not able to nominee someone to this position, even if both groups vote together. By the moment, the rector and the union of workers started to negotiate again. The police are expected to leave the campus soon. The lesson which seems to have been learned till now is that the university needs to rethink its own structures. It has still to find the difficult tune for attending social demands of inclusion and participation. Thanks to Comrade Rapha for informing us about this story. 120 professors and about 1,200 students and university workers were beaten and teargassed in the main campus of the University of São Paulo in Brazil last Tuesday (June 9). Conflicts started after a one month strike of university workers whose employment status is being disputed due to a legal controversy over university autonomy to hire its workers without approval of state representatives. Over one thousand workers might loose their jobs. Workers started a strike on May 5 demanding the preservation of their jobs and other labor demands. On May 27, workers started to block the entrance of four university buildings because, according to them, university management was threatening workers who were using their legal right to strike. On June 1, administration called the military police to intervene. On June 4 professors joined the strike protesting police occupation of campus. on June 5, professors had a two hours meeting with management asking for a non-military solution to the labor conflict. However, common sense did not prevail and military police attacked a peaceful demonstration of students and workers yesterday (June 9). 120 professors were discussing the crisis when the meeting was interrupted by news of a police attack. A few minutes later teargas and concussion bombs exploded inside the building. Several of our colleagues and students were hurt. The academic community is shocked. We ask the support of the international scientific and academic community by demanding university management the immediate withdraw of military police from campus and the non-violent resolution of labor conflicts in the university.